Glenavon's Mark Sykes is close to completing a move to Port Vale, BBC Sport Northern Ireland understands. Transfer talks are believed to be at an advanced stage between the 21-year-old midfielder and the League Two club. 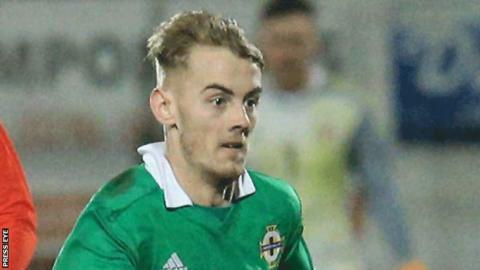 The Northern Ireland Under-21 international has been in superb form this season and has been linked with a move to England or Scotland. Port Vale are currently sitting 15th in the League Two table while Glenavon are third in the Irish Premiership. Sykes played in the Lurgan Blues' 4-2 defeat by Cliftonville in the league on Saturday. Speaking after the match, Glenavon manager Gary Hamilton confirmed the club had received a bid from Port Vale, but added that he was not fully aware of the most recent developments. "At the minute I don't know too much about it," Hamilton said. "There has certainly been a lot of interest in Mark and a bid was made about a week to 10 days ago. "That bid was rejected but I haven't spoken to the chairman today to know if a new bid has come in." Sykes has scored three goals in 19 appearances for Glenavon this season and also scored for the international Under-21 team in their Euro qualifier 1-0 win over Slovakia in October. His former Glenavon team-mate Bobby Burns secured a move to Hearts in the summer and is currently on loan at Livingston. Northern Ireland international Gavin Whyte also made the move from the Irish League to full-time football in the summer when he left Crusaders for Oxford United, as did Brad Lyons when he joined Blackburn Rovers from Coleraine and Stephen Dooley, who also left the Bannsiders to go to Rochdale.